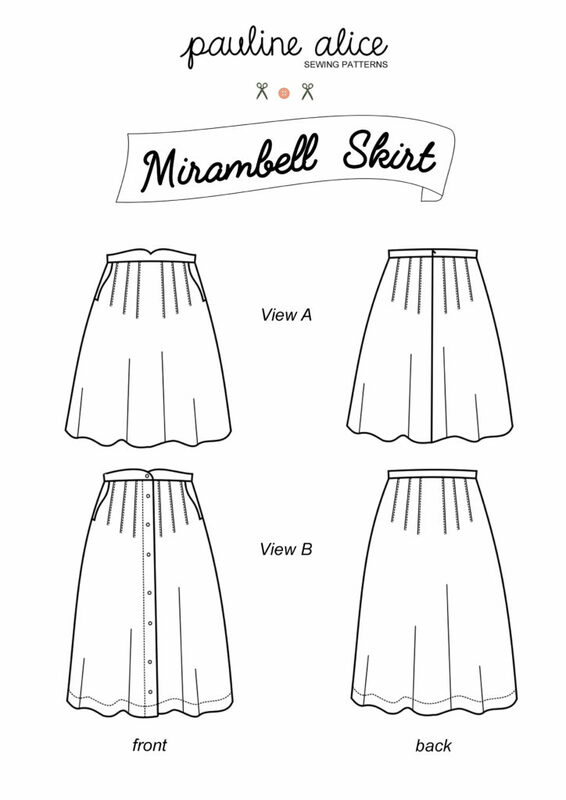 Home Tags Posts tagged with "skirt pattern"
Let’s start with the Mirambell skirt. It’s a retro inspired skirt pattern, with knife pleats and two lengths. The knife pleats are topstitched from the waist to the hips to highlight the body curves, then open to a full hem. With its high waistline, the Mirambell skirt hugs the hips while being really comfortable. The shaped waistband and pockets bring original details to the skirt design. You can also play with topstitching here, it can be either with matching or contrasting thread and it will showcase the curved shapes nicely. You’ll find two views for the Mirambell pattern. View A closes with an invisible back zipper and is short (above the knee). As for view B, it buttons on the front and is knee-length. 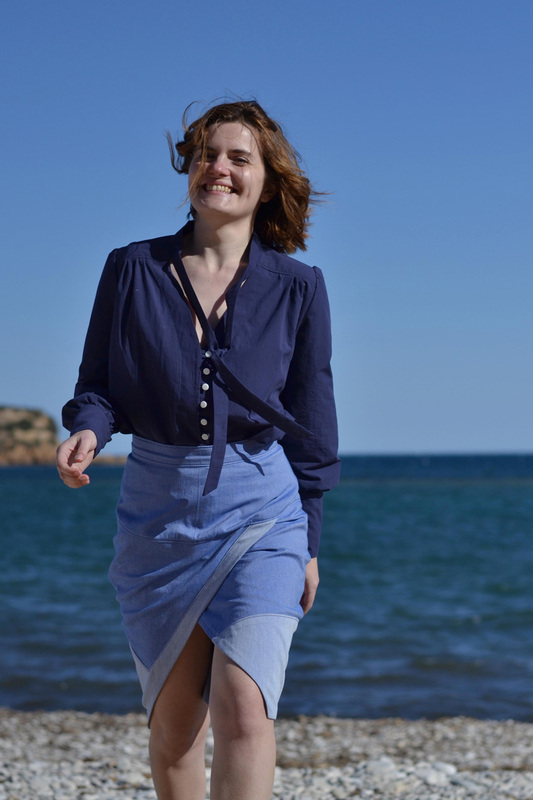 It’s recommended to choose lightweight fabrics for the Mirambell skirt: cotton, linen, rayon, crepe, chambray… and why not use a gabardine or light wool for a winter version? You’ll also need lining for the pockets (cotton woul be perfect but you can also choose bemberg) and interfacing for the waistband. For view A, you’ll need a 30 cm (12”) invisible zipper and for view B, 8 buttons of approximately 2,5 cm (1”) wide. Note: for the presentation models, we have used a curry crepe rayon for view A and an off-white linen for view B.
Here’s a very elegant skirt that will be perfect for the summer (and all year round). 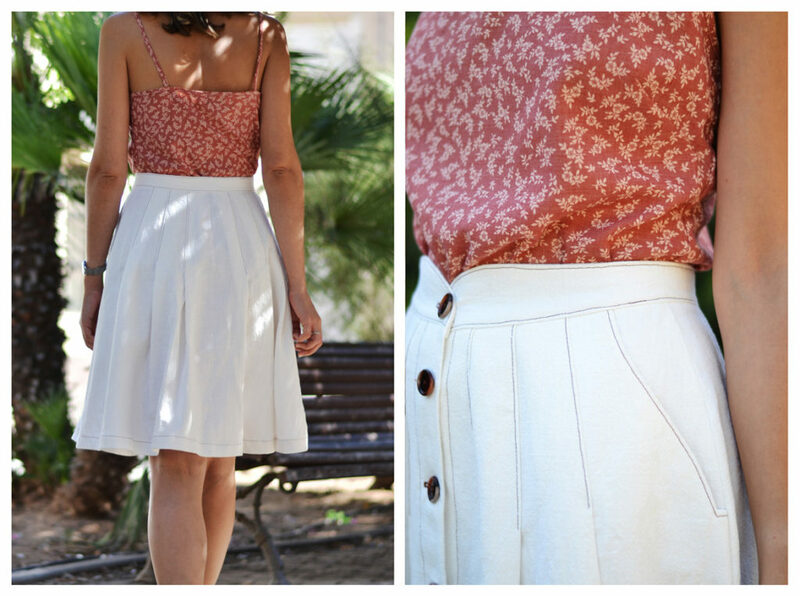 You can find the Mirambell skirt in the shop in both printed and PDF version. Today, let’s talk about the Safor skirt. Ever since making the Rosari skirt pattern, I’ve wanted to add another skirt pattern to the collection. And because I couldn’t decide between a short and casual and a knee-length one for more formal occasion, I chose to make them both. The Safor skirt is a faux-wrap skirt with a hip yoke that follows nicely the body’s curves. The great thing about the faux-wrap is that you can walk easily without the inconvenience of your skirt opening too high. 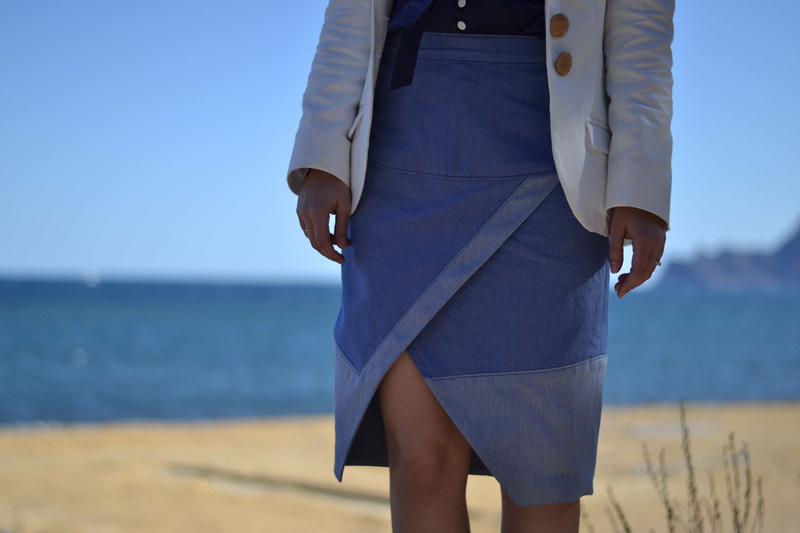 The Safor skirt is confortable and easy to wear. View A offers inseam pockets hidden between the yoke and the skirt and is quite short (there are lengthen/shorten lines on the pattern if you want to give a little more length to your skirt). View B is knee-length and has a contrasting panel along the hem. This is a great way to play with colors or fabrics contrasts. Both views have the same asymetrical fold-over front and close with an inviible zipper and a button at the back. I’ve used Les trouvailles d’Amandine ‘s denim for both versions: in “liane” shade for view A and “etendard” for view B (as it’s reversible, I’ve used the wrong side for contrast). You could also use any medium weight fabric with a little bit of body: denim, linen, gabardine, leather or suede for example.